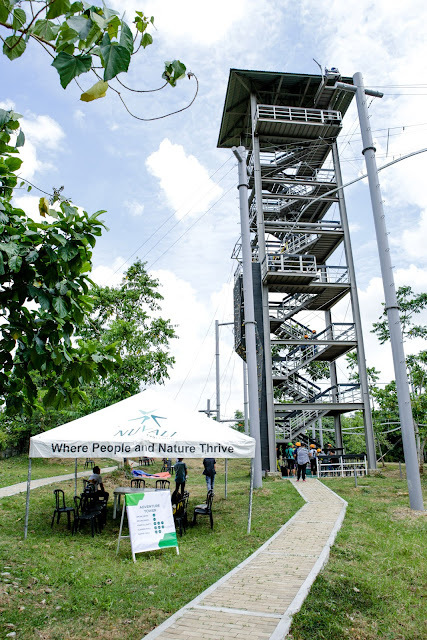 If you're looking for some outdoor fun not far away from Manila, why not explore the newest outdoor adventure hub in Laguna? Entrance to the Camp N facility. Camp N in Nuvali offers fun and adventure experiences that everyone can enjoy. 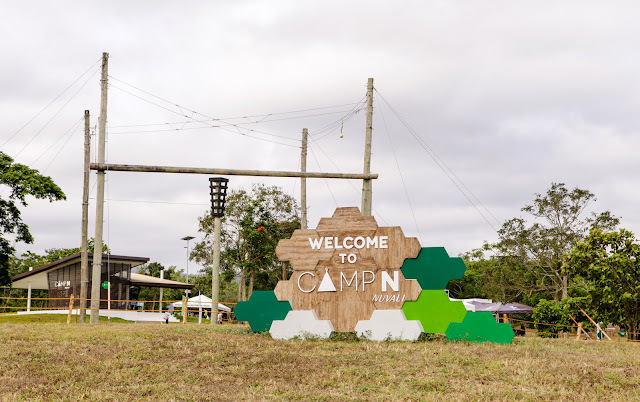 Whether you're going solo or with a bunch of friends or with your family, Camp N is the perfect place to discover yourself and log in a lot of bonding moments. "Nuvali's incubator for self-discovery, a special place for people to be involved in activities that promotes self-discovery, good health, environmentally sustainable living. This six hectare parcel taps into people's adventurous spirit and their desire to learn more outside the conventional way of learning things." 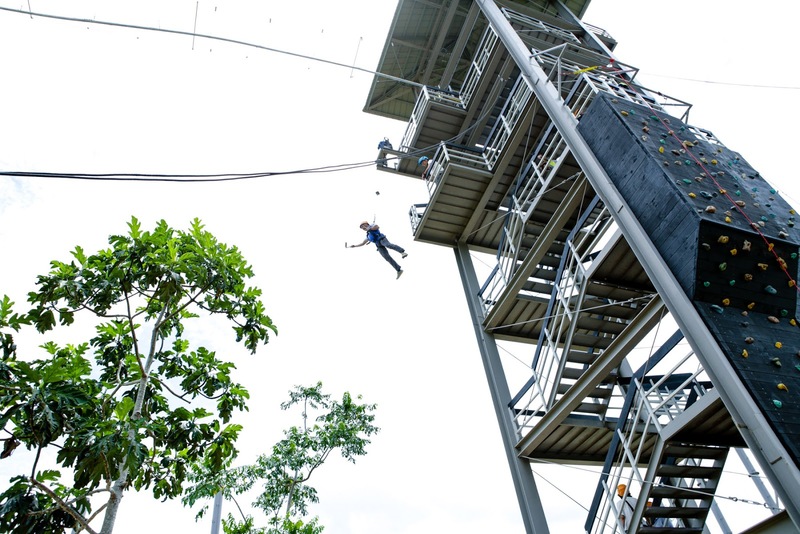 Indeed, when we tried the Aerial Walk, we had to learn how to navigate the many obstacles it presented so we could finally get to the final stage and experience the reward of a zipline ride. Here are some snapshots of us courtesy of our friend Dems. Dems in pink, surrounded by green. A groupie while still fresh-faced before we tackle the course. One of the wobbly wooden obstacles at the start of the course. Sarah going through some unstable, moving planks. Walking on the net, almost at the end of the course. 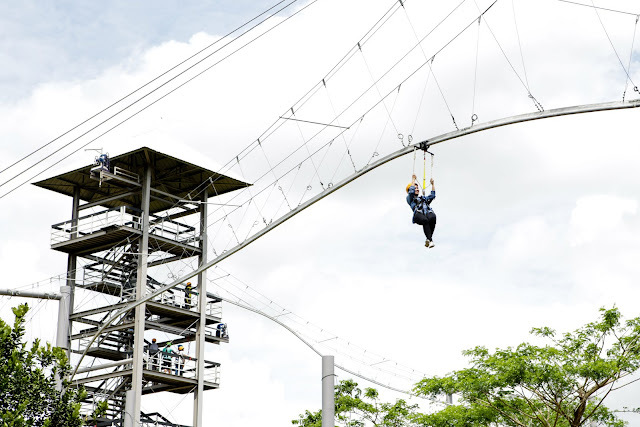 If you and your friends are looking to get a workout, try out the Aerial Walk. 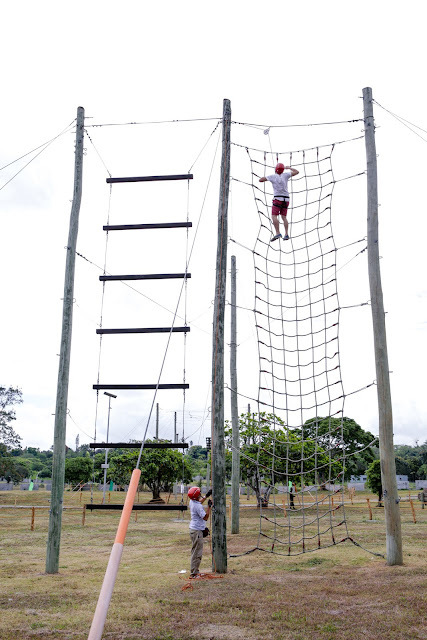 We could feel our muscles working extra hard as we navigated through the different obstacles. I actually felt my abdominals working! The next day, we were aching all over. It was a total body workout. It also challenged our brains as we had to try different ways of getting through to the next step of the course. We didn't get brain drain though. Instead, we experienced a satisfying, endorphine high about our accomplishment. We were sweaty and we worked our brain muscles as well! Camp N has an orientation area where visitors will be instructed on using the facilities and safety measures. It also has a shower area, a clinic, parking area, and soon-to-open canteen and camp grounds. Last April 16, Camp N was also the venue for the first leg of the AXN Ultimate Thrill 2016 which is "a multi-stage adventure race similar to the Amazing Race, also popularized by the AXN Network. Adventurers will go through intense obstacle challenges in Camp N and the first 20 finishers will head to Boracay for the final round." Only 200 teams from Manila may join the challenge. 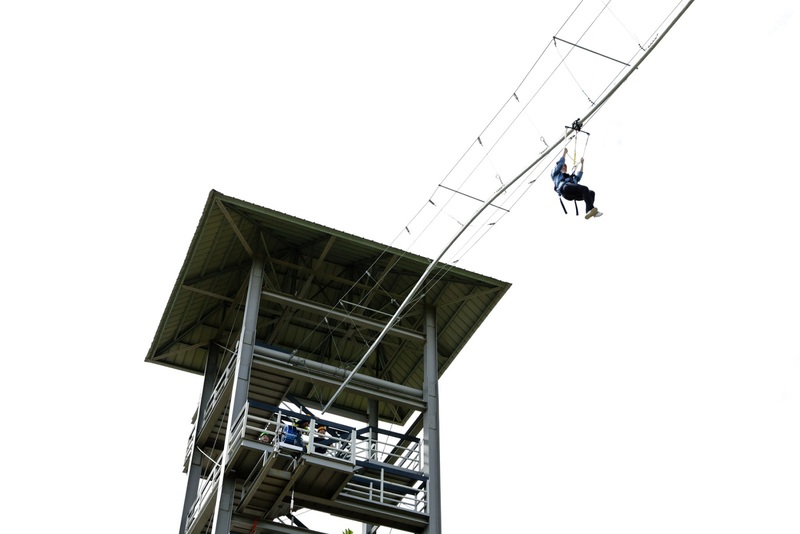 Camp N is perfect for team building activities and for school field trips. There is no age limit but a height requirement of 4feet and above and guests should not exceed the 270lbs weight limit. Participants should be in good physical condition. However, pregnant women and individuals with certain health conditions such as hypertension, cardiovascular disorders, orthopedic problems and similar medical conditions are advised against using the facilities. Another feature of Camp N is Green Patches which is a 3-hectare demo organic farm and nursery featuring a variety of endemic and indigenous tree and plant species. In fact, every single root crop and vegetable in the song Bahay Kubo can be found here. In the coming months, Green Patches will also feature activities such as fruit and vegetable picking, art workshops, group-led meditation sessions and other serene activities. For visitors' convenience, shuttles to and from Nuvali terminal to Camp N will also be available starting April 16, 2016. 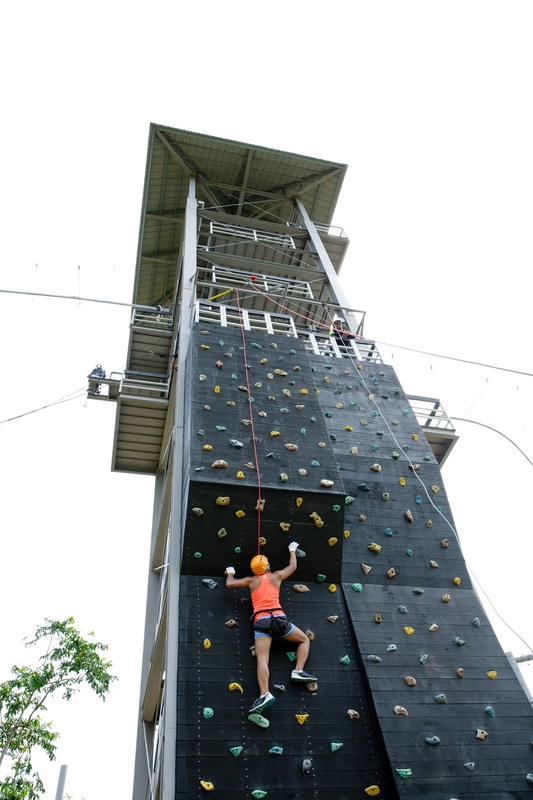 For team building sessions, guests can contact Camp N by phone at 0977-84-CAMPN or send an email to camp-n@lakbaykalikasan.com. Photos of facilities and brochures as well as quotes are from press kit provided. Location Map and photos of us in the Aerial Walk are author's.